Researchers: T. Durgonics, H.-H. Benzon and P. Høeg, Technical University of Denmark; A. Komjathy, O. Verkhoglyadova, E. B. Shume, and A. J. Mannucci, Jet Propulsion Laboratory, NASA , M. D. Butala, University of Illinois, Urbana-Champaign (now at Hainan University in China); and R. B. Langley, University of New Brunswick. Two coronal mass ejections from the Sun impacted Earth in February 2014 creating disturbances in the Arctic ionosphere. Multiple instruments measured the disturbances, particularly the Greenland GPS network (GNET). 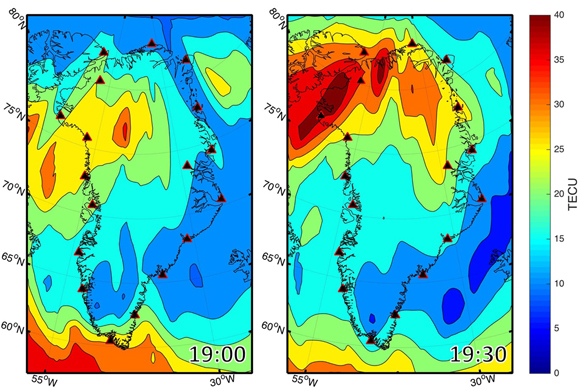 Analysis shows the solar inputs heated the polar atmosphere causing an upwelling of nitrogen-rich air that altered the normal ionospheric dynamics. A better understanding of ionospheric dynamics can help with space weather forecasts and warnings. A coronal mass ejection (CME) from the Sun is an explosion of intense radiation and ionized particles from the solar surface. If the CME is directed toward Earth, it can create a disturbance, starting with a shock wave deforming Earth’s magnetosphere. The geomagnetic activity can be detected at magnetic observatories in the Arctic. The activity quickly creates an ionospheric storm in the uppermost atmosphere and the storm can be observed using total electron content (TEC) and scintillations measurements collected by ground-based GPS/GNSS receivers, ionosonde data and other observations of the ionospheric plasma. The observations used in this study cover 6 days from 17 to 22 February 2014. The first CME reached Earth on 19 February and the second CME reached Earth on 20 February. Measurements from the first two days show normal conditions and those from the subsequent 4 days track the complex changes created by the CMEs. 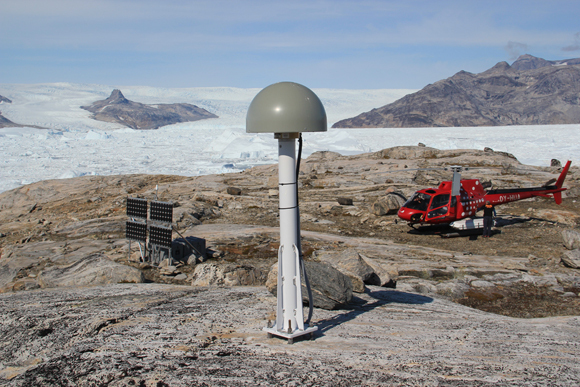 UNAVCO operates and maintains a network of GPS sites in Greenland, called GNET. 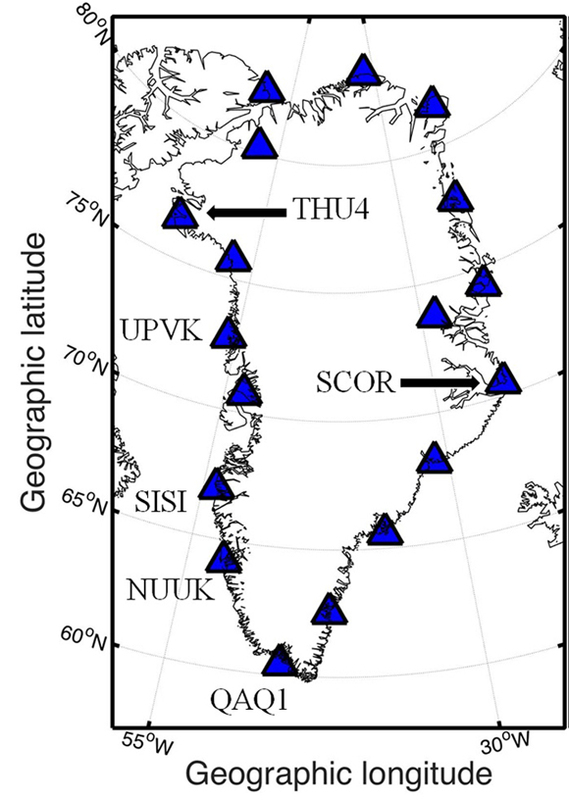 These sites provide a useful geometry for space weather measurements because Greenland is situated below part of the polar cap and auroral oval providing good latitudinal coverage of the Artic ionosphere. Combining all of the observations yields a detailed description of how two CMEs interacted with the Arctic environment. The first CME caused one small sudden impulse from the arrival of the shock wave into the polar magnetosphere. After the first CME, the second CME arrived within 24 hours. The two CMEs caused a depletion in the TEC in the uppermost ionosphere, which is called a negative storm phase. 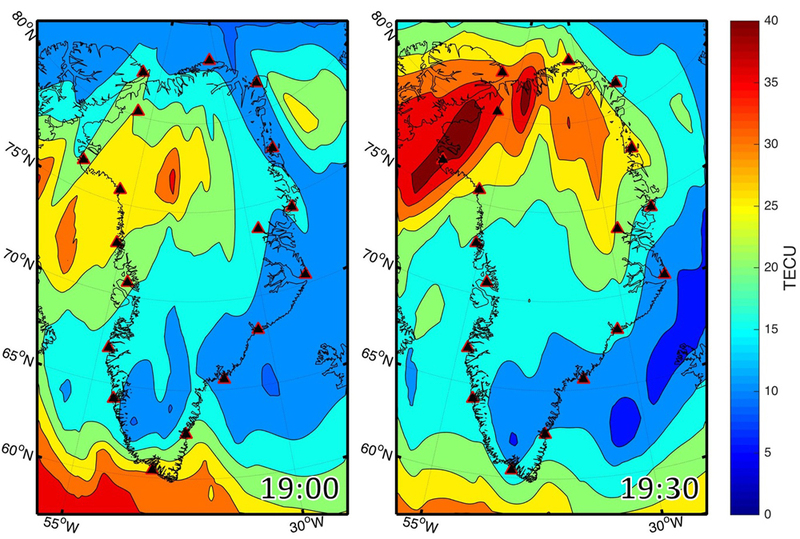 During the negative storm phase, the ionosphere heated up and a nitrogen upwelling rose within the polar cap. These storm dynamics caused a shift in the atmospheric composition and a extension of the auroral oval toward the equator. Studying the storm dynamics will improve our understanding of the Arctic atmosphere and the effects of CMEs on the atmosphere and potentially on society during an extreme space weather event. Durgonics, T., A. Komjathy, O. Verkhoglyadova, E. B. Shume, H.-H. Benzon, A. J. Mannucci, M. D. Butala, P. Høeg, and R. B. Langley (2017), Multi-instrument observations of a geomagnetic storm and its effects on the Arctic ionosphere: A case study of the 19 February 2014 storm, Radio Sci., 52, 146–165, doi:10.1002/2016RS006106.